I have had the NiteSite spotting unit for a while now and it has accounted for numerous rats and rabbit but I had yet to use it for spotting Fox. CPTV's Lisa and I met with my shooting buddy Alan recently at one of our permissions that has a fox problem. We set up in our usual spot in the corner of the field which offers the safest shot and largest area of observation. When plotting up in a vehicle or on foot always make sure you are not silhouetting your self against lights or a skyline. With that in mind we backed our vehicle up towards a wooded area in the corner of the field. The NiteSite spotter was giving a clear view all the way to the edge of the square wood which is about 500yards. 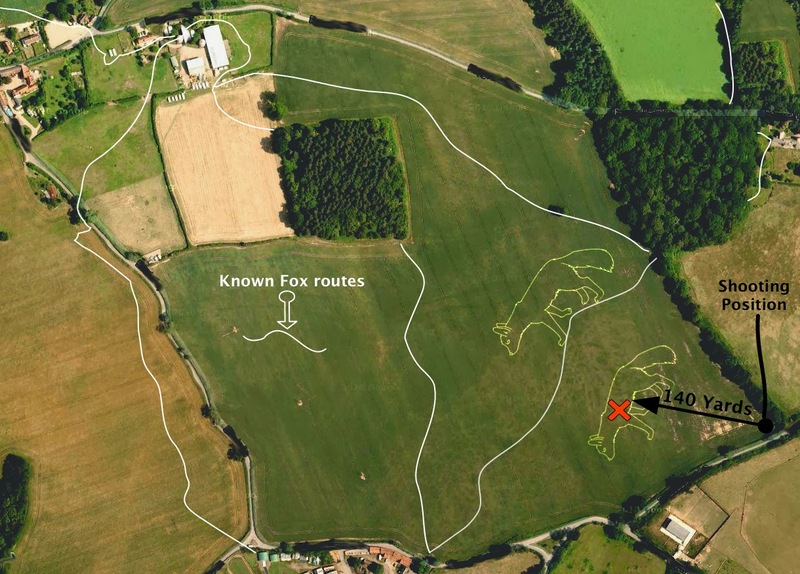 The image above shows the direction of the shot, the distance to the fox and the shooting position. Another important thing to take notice of here is the direction of the wind. Most of the time at this permission the wind will blow straight in our faces in the corner where we set up. If it is blowing from a different direction we move to another safe position to make sure we are not winded by the fox. So the plan was to sit tight for a while and then start calling, alternating the methods using the ICOtec GC300 from Best Fox Call and the NiteSite spotter. It was now early December and had started to get pretty cold out. Food this time of the year starts to get harder to find and the fox’s usual diet of slugs, beetles and worms can at times become almost impossible to get at. The hard ground, snow and laying water make life very awkward and as a result fox’s become very active looking for food. This is when calling can really produce fantastic results. That is not to say that in the summer months you can't get results calling but when they are hungry even the wiliest of foxes can drop their guard. Alan was using his .243 with Hornady V-Max hollow points and Red Field optics. I was operating the caller and NiteSite spotting unit leaving Alan free to concentrate on the the most important bit. 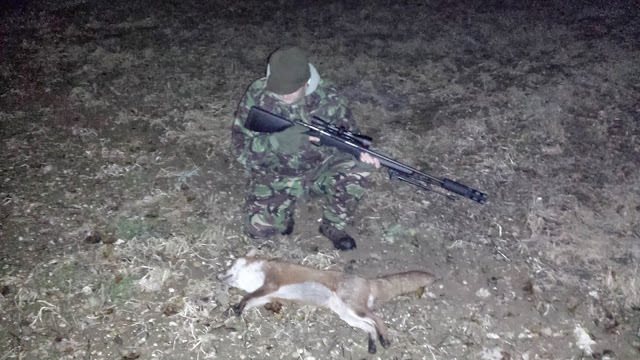 Now Alan has been shooting for years and has tones of target experience but he was still to shoot his first fox. We had run in to them a couple of times while rabbiting with the .17 HMR but range wind conditions and my lack of confidence in the HMR as a fox control round had stayed Alan’s trigger finger. We were now wondering, would tonight be his lucky night? Well the with the kit we’re using the odds were stacked well in our favour. We were in place by about 8pm and in preparation for the cold night Alan broke out the flask of hot tea which is great idea at this time of the year. 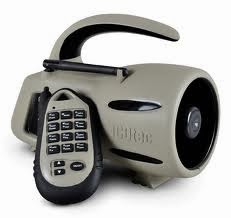 I woke up the ICOtec caller and started to scan the field with the spotter. Now I don’t claim to be a fox shooting expert but I know from experience that just when you least expect to see them they will just appear from nowhere. I could tell Alan was getting slightly itchy feet but I assured him that sitting tight in this spot should pay off. I have taken many fox from this position in fact last year we took 12 in two nights. I know their routes well and on a rabbit outing recently we spotted two fox in front of our shooting position about 10.30pm. I remember saying to Alan that we might see them around the same time as the fox is a creature of habit. As 10pm approached the temperature seemed to plummet suddenly making the extra layers of thermal clothing very welcome. A warm hat and some good gloves are essential on this sort of outing. 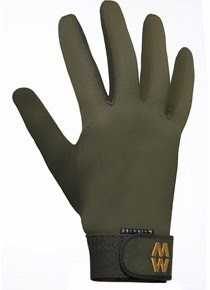 I use a nice lightweight glove made by professional sport glove specialists MacWet. I highly recommend them for any type of shooting, ex female world HFT shooter Steph Kirkwood put me on to these a few years ago and I have warn them ever since. So….. Lisa, Al and I were just about to have another cup of nice hot tea when from out of nowhere two fox appeared a little short of their usual route. I very quietly alerted Alan and gave him a direction and waited for him to get ready for the shot. Once he had indicated that he was ready to let the lead fly I hit the first fox with the peripheral light from our trusty LightForce lamp. When using a lamp on live quarry it’s definitely a case of "less is more". I lit up charlie with just enough of the beam for Alan to see his shot placement. A loud crack followed instantly by a solid thump indicated that it was a good hit. Understandably excited Alan was about to start celebrating his clinical execution unaware of the second fox now belting across the field. I hushed Alan and asked him to reload as quickly as possible but as I lit up the field again all we could see was the hind quarters of number two disappearing though the thicket. Now it was time to make safe the rifle and go and meet Alan’s first kill. The shot was perfectly placed and the unlucky animal lay exactly where it had been hit. It was a magnificent specimen, I don’t think I have ever seen such a clean, well fed and bushy fox as this. I guess that is how you look when you have a diet of chicken and goose. I like the way Alan expressed himself about his kill. When staring down at it he said “it is a shame to have to kill such a beautiful animal” and I agree. I do not think any of us should be enjoying “the kill” but the enjoyment that can be had in the execution of our duties is a reward that has kept me coming back since I was a young lad. Alan did a good job and I think next time out he’ll be ready for that double. 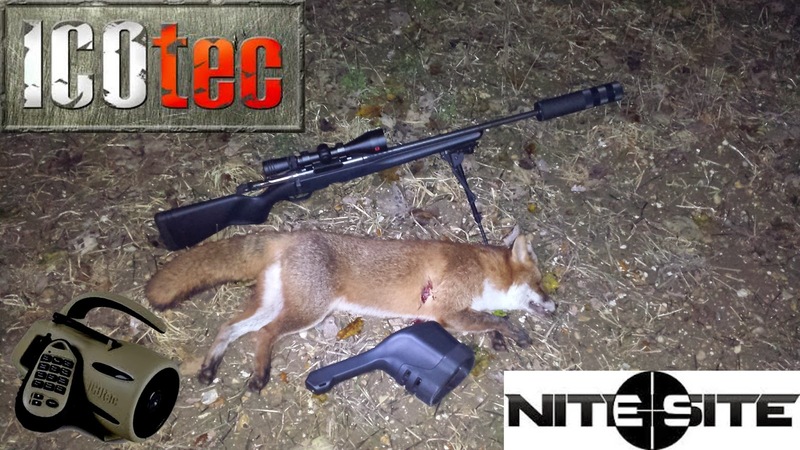 You don’t need a thousand pounds worth of equipment to outsmart a fox but having the NiteSite Spotter and ICOtec caller made this evening a piece of cake. Well done Al this will be the first of many!